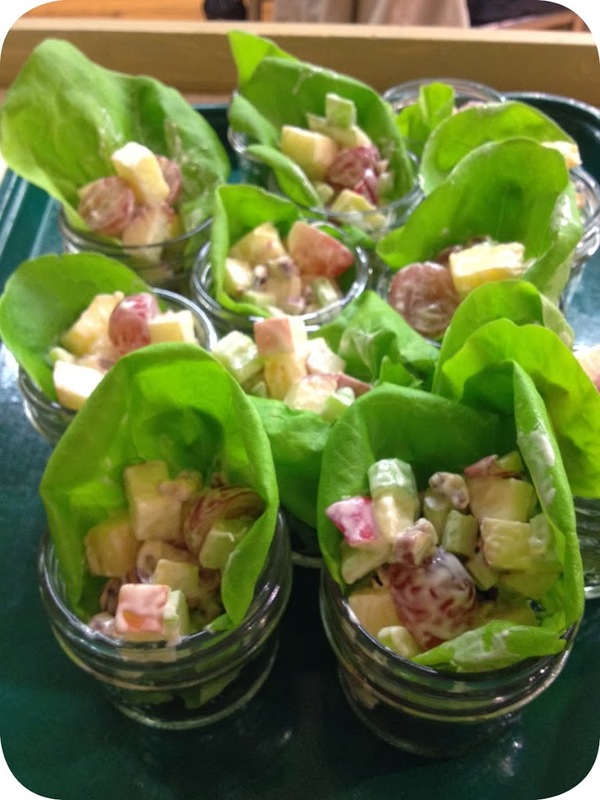 Many versions of Apple Waldorf Salad have been floating around since the salad's inception in the late 1800's. Prior to making Waldorf salad myself, I swore I didn’t like it! I think I was tainted by the weepy presentation of Waldorf salads in grocery store deli cases. If you fall into the same camp as me, I strongly suggest you give Eckert's Waldorf Salad recipe a try. Juicy fruits, creamy dressing and crunchy nuts give this salad excellent texture and balance. Of course, it is best eaten immediately when the fruit is still fresh and the dressing hasn’t drawn too much moisture. , we turned this vintage recipe into an trendy appetizer. Ball jars seem to be very popular now so we tucked a few leaves of Eckert's Hydroponic Lettuce (now in season) into the jar and topped it with a scoop of Eckert's Waldorf Salad. Not only was it an adorable presentation, the class participants raved about the salad just as we expected. Combine apples, celery, nuts. Stir in enough mayonnaise to moisten. Add in grapes and pineapple. Cover and refrigerate for up to 1 hour or serve immediately. Upcoming Appetizer Classes will be held on Wednesday December 11th and 18th from 12-1pm. Visit our Eckert's Events for more information!